If you hate your boyfriend, serve this to him on Valentine's Day. Serious Eats reports that the newest burger at Japanese chain Lotteria comes with milk chocolate sauce on top. But no, the straight-up weirdness of this burger doesn’t stop there—the chocolate burger comes with a dollop of honey mustard and a baked chicken thigh patty. 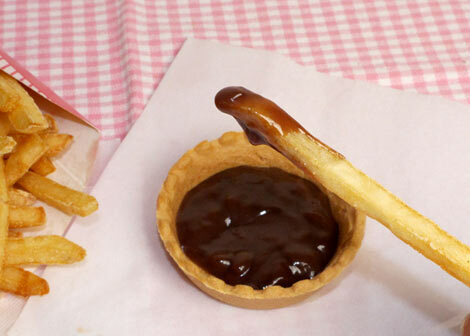 And did we mention Lotteria also sells chocolate sauce to dip their french fries in? Mr. Sato of RocketNews24 took the chocolatey fries out for a test drive. It didn’t taste like chocolate at all! Mr. Sato was expecting a rich chocolatey flavor, but sadly there was barely a hint. It was also only slightly sweet, which didn’t support the saltiness of the fries. The only flavor Mr. Sato could distinctly taste was that of themizuame (starch syrup). If you’re weird enough to want to try this yourself, the chocolate and honey mustard grilled chicken burger will be available starting today, February 6th, and will remain on the menu until the end of the month.